Spread hygge happiness throughout your life.The Secret Joy of Hygge (HOO-gah) shows you how to make small changes to bring more warmth and joy to your everyday life. Sipping a cozy cup of tea. Nesting at your desk surrounded by your favorite plants and pictures. Gathering loved ones around your table. All are the hygge way.With simple, actionable techniques, you’ll learn how to embody hygge inside—and how to live it at home, at work, and with family and friends. 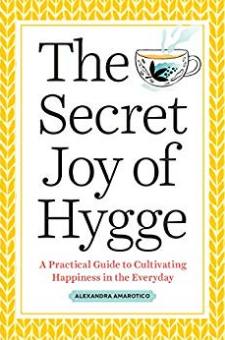 If your life is a little frantic and you’re looking to slow down, de-stress, and increase your overall happiness, this book is for you.The Secret Joy of Hygge includes:Hygge 101—defines hygge, explains the history behind the concept, and describes its role in creating happinessHygge for all—shows you how to apply this Danish idea to your life no matter where in the world you liveBeyond hygge—examines related topics like meditation, feng shui, and minimalismExplore hygge and discover the simple joys of unplugging and reconnecting with yourself and your world. Let these step-by-step strategies be your guide.